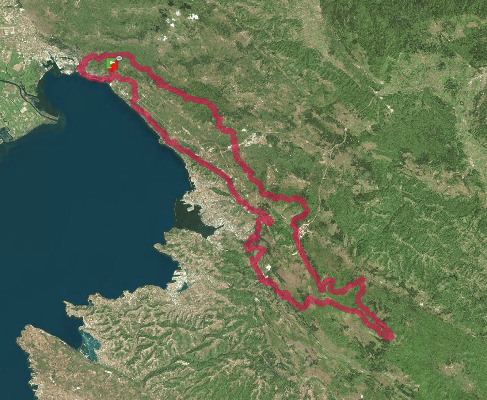 A perfect ring, starting by the sea, first along the Gulf of Trieste, then to enter the highlands of the Bora wind, to reach the snowy Mount Slavnik, running on the border ridge between Italy and Slovenia, between Slovenia and Croatia and coming back to Italy on the CAI 3, who became famous for the “Cavalcata Carsica”. “The wildest and most Resilient Endurance Run” logo-s1-iper_90 A continuous alteration of fast sections, breathtaking views of the Gulf of Trieste and steep paths in the magical and wild beech forests of Slovenia. A trail that embodies all the variety of landscapes and terrain, from the dry limestone and Dolomite to the snowy peaks of Slovenia. Sections where navigation takes place following the ridges and with GPS along with wild slopes which then lead to easy tracks. Each section is a surprise, every kilometer a challenge in adaptation. The route will be marked in the main points, the marked trails with hiking signs, but the use of GPS is required. If there is snow, strong winds or adverse conditions may be the only way not to get lost.